Now let's turn to my leisure time activites (yet without doing a striptease of my soul): Of course, there is my family; then, there is my computer still running under Linux for historical and ideological reasons (in fact, Linux might be the better operating system). To the right, you can see a photo showing me playing beach-volley. Unfortunately, I am just starting off the ground, not yet at the highest point! 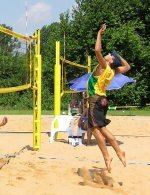 If you are interested, you can look at my results in beachvolleyball tournaments at BVV-tournaments and at ebf-tournaments. In winter, I play indoor volleyball with the SV Lohhof. During winter (if I am not playing volleyball), I am strongly attracted by mountains to ride my snowboard (a Pogo "Hot Edge" Raceboard). 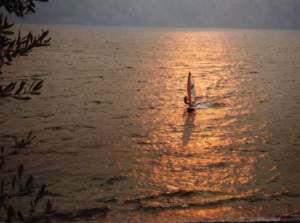 Windsurfing (here a picture of me surfing Lake Garda, Italy, when I was young) is another great summer-time-leisure. 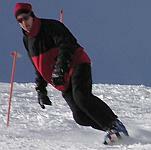 So is kiteboarding; plus, the equipment is lighter, and it works with somewhat less wind! 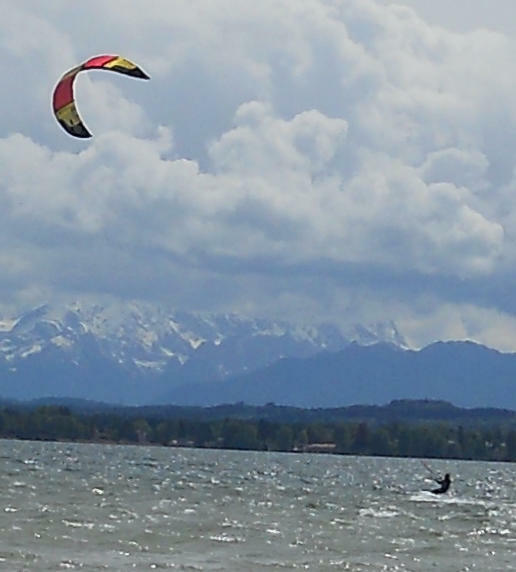 To the left, a picture of me surfing on Starnberger See in 2015. If there is any time left, I do inline-skating or juggling.